Kron Gracie makes his UFC debut and although he hasn’t had an MMA fight in over two years, he arrives with a lot of hype. As a member of the Gracie family, it is no surprise he is an incredibly accomplished Brazilian Jiu-Jitsu practitioner and he has generated the hype by successfully transferring these skills over to MMA, winning all four of his fights via submission. 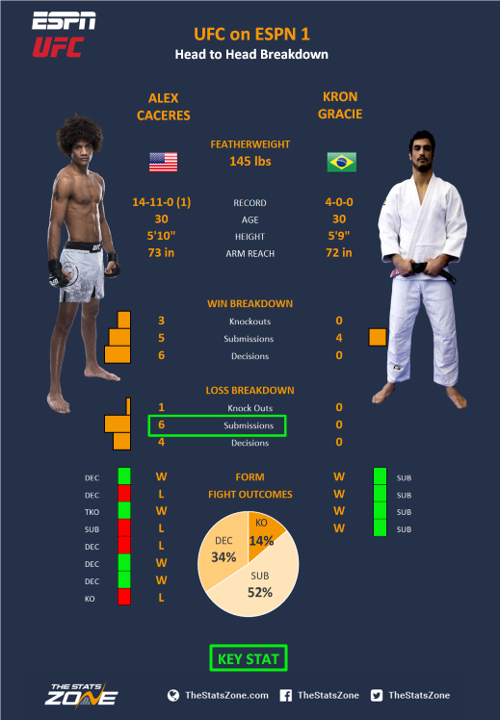 It seems the UFC want to build Gracie as this is a very kind match-up for him. Caceres is a well-known name and exciting fighter but he has a weakness in his grappling, highlighted by six submission losses. Great news for a decorated Gracie who only needs to get the fight to the floor once so if Careres’ takedown defence is not immaculate, he will be in trouble. ‘Bruce Leroy’ is a different class on the feet but with a takedown defence of only 59.6%, he may be receiving a lesson from Gracie.